Robin Bengtsson made it directly to the final with ‘I Can’t Go On.’ It is co-written by David Kreuger, who also written for Céline Dion. He joined Max Martin’s Cheiron Studios already in 1993. Credits include hits for E-Type and Leila K as well Boyzone. One of his biggest hits is Westlife’s ‘If I Let You Go.’ In 2014, he made it to No.3 in the Eurovision Song Contest with ‘Undo’ for Sanna Nielsen. I recently covered FO&O’s entry, which is another huge hit at the moment. Since its release, the group crossed the 1m streaming barrier. I also mentioned that it was co-written by Robert John “Mutt” Lange. Back to Loreen. ‘Statements’ is currently No.17 on the streaming daily chart. Unfortunately, it didn’t amass enough televotes to qualify for the final. International fans are furious about Sweden’s decision not to send Loreen to the final. A local article even suggests her competing for San Marino?! Wiktoria is indeed the biggest Melodifestivalen entry on Spotify. Chart-topper Joakim Lundell has 72% more plays. WelcheMusic.com will continously report on the Melodifestivalen success on Spotify. Source: Total no. 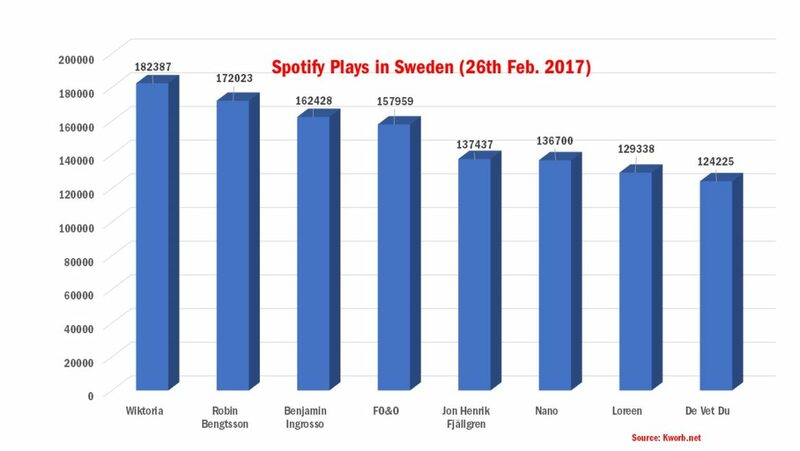 of Spotify plays in Sweden as of 27th February, 2017. Statistics from Kworb.net. The list does not contain tracks not featured in Melodifestivalen.